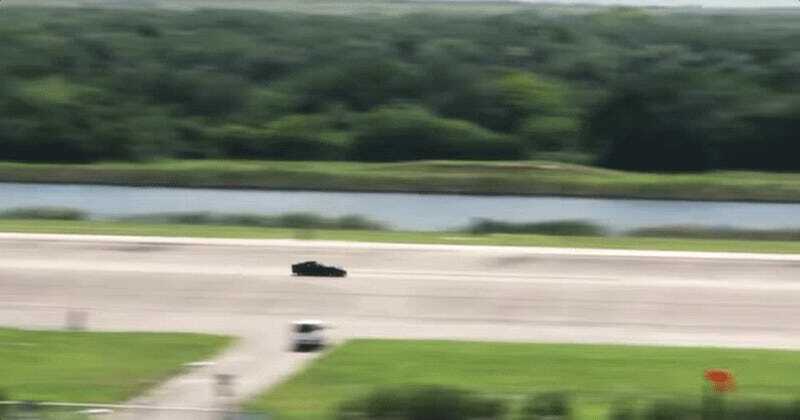 Genovation Cars has been teasing images of their supercar hitting more than 200 mph ever since announcing plans to make an all-electric Corvette in late 2016. Now, ahead of the car’s debut at this year’s Consumer Electronic Show, Genovation has unveiled some of the cars’ final specs, including a top speed in excess of 220 mph. The Maryland-based Genovation modified a C7 Grand Sport-based GXE, and stuffed it with a twin electric motor powertrain that can deliver 800 horsepower and 700 pound-feet of torque. The car can crank up to 60 mph within three seconds, a hairline away from a fully-optioned Tesla Model S.
Motor1 says the GXE features a 60-kWh battery pack that can handle about 130 miles of range between charges, similar to what was suggested earlier this year. It’s not going to be cheap, though. Genovation wants to sell the car to you for three-quarters of a million dollars. But yeah, if you have any question as to how fast this thing can crank, take a look at how far away the cameras are situated in the video above just to keep up with the car. I’m really hoping we can catch a glimpse of this thing up close next month.